Is this drum really equipable in the primary slot? If so its a great drum then, the ones I have now at lvl 18 are all secondary only. 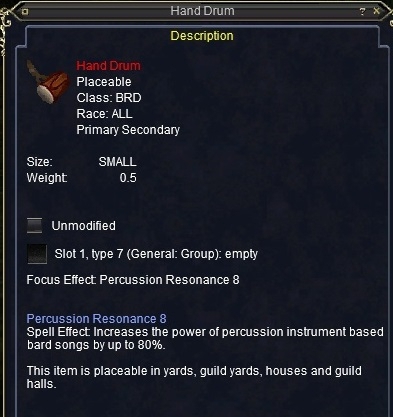 The Hand Drum I tried today lists only SECONDARY on inspection and would only equip in that slot (on a Bard with dual-wield; an ability which really only effects weapons but thought it worth mentioning). I cannot get the hand drum to equip in the second slot if I have a 1H weapon equipped in first slot. Anyone know what is wrong? If I equip the hand drum, then I can't equip the weapon. Help please? That is how all instruments work. You must remove items from primary and secondary before you can hold the instrument in your secondary. ok, so that's how it works. but why? I'm not sure I understand the point of making it so you can't have a wep equipped with a instrument if it's going in the secondary slot. if you can't use anything in primary while you've got an instrument in secondary, wouldn't it be a bit like a primary? semantics I know, but, darnit, enquiring minds want to know. Because thats the way it is period. You have to work for an instrument that goes in primary slot. Primary slot instruments can be clicked in a split second before your song hits for the effect of an instrument to your song then replaced with a weapon immediatley after. But as youll notice there are not that many primary instruments. you have to have both hands to ensure that you rock out to your fullest potential. This instrument can be obtained from the spiderling silk quest in Kelethin bard's guild.